The Yellow Freight Company was founded in 1924 in Oklahoma City, Oklahoma and subsequently merged with Roadway in 1930 in Akron, Ohio. They are the leading transporter of industrial, commercial and retail goods for businesses across North American using a full-service network and advanced information technologies to provide proactive customer service. They are the only transportation provider that offers the only patented Sealed Divider Freight protection for shipments that are difficult or expensive to package that are valuable. They are the only transportation provider that has on-site border crossing representatives in North America. First LTL transportation provider to receive the ISO certification to ensure quality controls for system integrity and security. If that’s not enough, YRC Freight is also an information technology leader in the transportation provider field. YRC offers internet-based services that provide customers the ability to see where their shipment is at all times. YRC is the first transportation provider to combine cellular and satellite technologies to gather and send real-time data of pickup and delivery routes. This messaging system improves responsiveness to fulfill your needs for pickup service and shipment information. Seamless delivery throughout the United States, Canada, Alaska and Hawaii. All drivers have CDL with hazardous material endorsements. Sealed divider and freeze protection equipment is available. YRC has a 24/7 chemical helpline to assist you in making sure your hazardous materials are packaged and labeled correctly for shipping. With all of their safety training and certifications, you can rest assured that your shipment is in good hands when being taken to its destination. Six of the eighteen captains that were selected in 2009-2010 America’s Road Team by the American Trucking Association were YRC drivers. These individuals were chosen to represent the industry and promote highway safety. YRC drivers and dock professionals teach industry and safety issues to the national media, legislators, community organizations, and schools. As part of the U.S. Department of Transportation public safety campaign, YRC trailer have the “No Zone” message on them. One YRC driver has more driven more than 5 million miles without an accident. YRC Freight is the best choice for all of your industrial, commercial and retail needs. 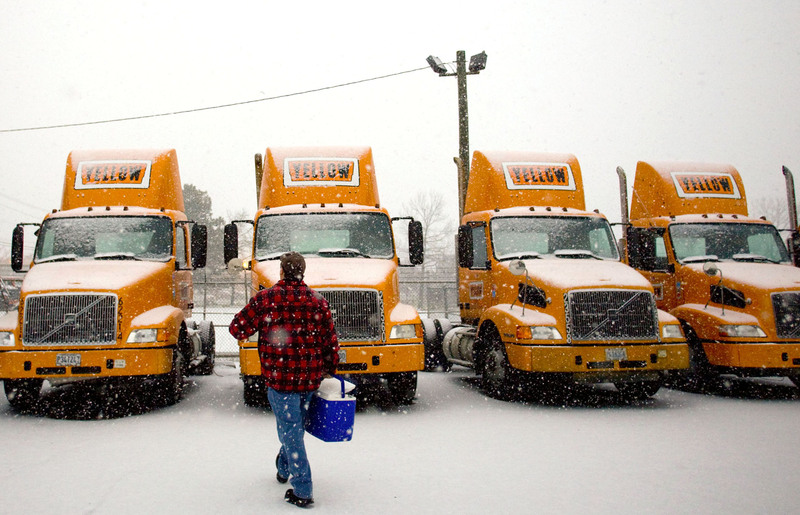 Yellow Trucking has been in business since 1924 and in 1930 purchased and merged with the Roadway Company, making what is now known as YRC. YRC is the largest subsidiary of YRC Worldwide Inc. YRC is your one-stop place for all of your industrial, commercial and retail goods shipping needs. YRC provides seamless LTL transportation throughout the United States including Canada, Alaska, Hawaii, Guam, the U.S. Virgin Island and Puerto Rico as well as off-short locations. YRC offers two, three day and cost to cost service with connecting key markets. If time is of the essence, YRC offers YRC Time-Critical service with guaranteed delivery via ground or air. YRC is a leader in their industry due to being the only transportation service to offer guaranteed delivery of tradeshow exhibits at no additional charge as well as offering sealed divider service and transportation of hazardous materials. YRC also has on site representatives at border crossings to expedite Customs clearance. YRC offers standard, expedited, guaranteed, specialized and global logistics services. All of these services offer guaranteed delivery and safe handling of your goods along with the ability to see where your goods are from their origin to their final destination. This ability comes from their internet-based services that provide in-transit shipment visibility. And their secure web-based applications along with their electronic data interchange capability. YRC is the first transportation service that uses both cellular and satellite technologies to gather and send real-time data during the pickup and delivery process. When shipping globally, YRC’s global logistics will keep you in touch with your goods from the loading dock to your front door. YRC is the holder of the first nationwide LTL transportation provider of the ISO certification. This certificate ensures that the transporting and handling of goods meet international quality standards. YRC goes beyond the one-time ISO certification by having a third-party registrar perform periodic quality process assessments. Another great thing about Yellow Trucking is how charges are calculated. If your shipment doesn’t require you to use a full truck, you are not charged for a full truck. Yellow Trucking only charges you for the space that your shipment actually takes up. It is easy to get a quote, keep track of all your shipment, print bills of lading, print invoices and request a pickup when using YRC online. YRC is definitely your one-stop shop for all your shipping needs.